Radicals, extremists, anarchists, terrorists… they’ve been around in some form since the dawn of civilization. As for Verloc’s domestic situation, he lives above the shop with his wife, Winnie; her brother, Stevie; and their aged mother. The mother thinks Verloc “a very nice gentleman.” Stevie idolizes Verloc. And Winnie is mostly oblivious to her husband’s secret life. Verloc consorts with three anarchists, Michaelis, Ossipon & Karl Yundt. The men meet regularly at Verloc’s home/shop. They mostly talk about stirring up the masses and upsetting the status quo but take little action beyond distributing dubious pamphlets. Verloc quickly realizes this “lazy lot” would not be suitable for undertaking the operation with which he had been tasked. The story then takes a sudden shift forward. Comrade Ossipon meets with a curious character known only as The Professor who deals in explosives. “There are very few people in the world whose character is as well established as mine,” says the man. He is known to the authorities, but claims he will never be arrested. He always wears explosives on his person and would not hesitate to use them, willing to die rather than be captured. It is from the Professor that Verloc obtains the explosives he needs, and we learn that the bombing has taken place but gone awry. The next few chapters relate the investigative efforts of Chief Inspector Heat and an unnamed Assistant Commissioner. Both men have differing motives to uncover the truth behind the bombing in Greenwich Park. Both men’s competing inquiries will lead them to Verloc’s door. When Heat confronts Verloc—in the presence of Winnie Verloc—we learn the fate of Stevie. “Blown to small bits: limbs, gravel, clothing, bones, splinters – all mixed up together. I tell you they had to fetch a shovel to gather him up with.” says Heat of Stevie’s demise. A label in the remains of Stevie’s overcoat led Heat to Verloc. Heat chastises him, but ultimately lets him go, advising Verloc to “clear out while you may.” Presumably this is because Verloc had served as an informer for Heat in the past, and Heat had no directive to make the arrest. Verloc instead plots his revenge against the Embassy officials by telling all his (and their) secrets. “Anarchists or diplomats were all one to him.” “As a member of a revolutionary proletariat – which he undoubtedly was – he nourished a rather inimical sentiment against social distinction.” This plan would align with that of the Assistant Commissioner, who would thwart further subversions by foreign embassy officials. However, Winnie has realized the horror of what her husband has done. “He took the boy away to murder him.” All at once she feels guilty for having encouraged Verloc to spend more time with Stevie and realizes that—no longer having to look after the boy—she has gained a level of freedom. “From a certain point of view we are here in the presence of a domestic drama,” states the Assistant Commissioner, aptly summing up the story’s denouement. 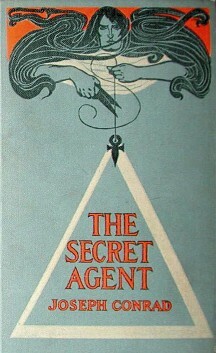 Published in 1907, Joseph Conrad’s The Secret Agent is considered one of the forerunners of political/ spy thrillers and espionage stories. Written at a time when anarchy was on the rise, the novel’s terror plot is based on the very real Greenwich Bombing of 1894 in which a French anarchist Martial Bourdin died when the bomb he carried prematurely detonated. However, it is the story’s more “domestic drama” that truly elevates this classic. Verloc’s mission – pressed upon him by unnamed foreign adversaries – may drive the central plot of the novel, but it is the tragic end of Stevie, an early literary example of an autistic character, that serves as the catalyst for the novel’s final act. An absolute tour de force intimately focused on Winnie’s thought process as she grapples with the truth of Stevie’s death and her own subsequent actions. The Secret Agent may not be the most accessible read with its shifting timeframes and narratives, but it is definitely worth reading as an early example of the spy genre and its insights into the human psyche. In many ways it is a more believable, plausible story than Edgar Wallace’s The Four Just Men, a thriller with similar themes published two years prior. Joseph Conrad (1857-1924) was the author of several novels and short stories, many with a nautical theme drawing on Conrad’s experiences as a merchant-marine prior to his career as a writer. His best known works include: Heart of Darkness (1899), the basis for the 1979 film Apocalypse Now; Lord Jim (1900); The Secret Agent (1907); and the novella, The Secret Sharer (1910).